My buddy Nancy is a city girl who gardens as best she can in pots and planters. Because I have two acres and a husband with a tractor, I get her excess seedlings in the spring. Like a cook who can’t waste leftovers, she will bring me a couple of leggy tomato plants or a few milkweed grown from seed. This year she showed up with two adolescent tomatillo plants. “They flower but I can’t get them to produce fruit,” she explained. That was June. By the end of July I saw on Facebook that her remaining tomatillo plants had produced so much fruit she was looking for new recipes in which to use them. My plants were just as prolific and I was just as clueless. Oh, I made green tomatillo salsa once and I could make another batch, I guess, but I grew these precious tomatillos myself. I watched each one turn into a plump, ping-pong sized green ball nestled in a fragile, papery husk. I didn’t want to just mush them up in a food processor. They deserved a more glorious demise. Then Nancy posted a mouthwatering salad photo on Facebook. I looked closely and spotted tomatillos. Yes! A dish worthy of my babies! Nancy found the original recipe on Serious Eats. I adjusted amounts and ingredients to suit my taste and the ingredients I had on hand. Because tomatoes are in season, I used them instead of a red bell pepper, and substituted a jalapeno for a serrano pepper. The entrée salad is colorful and refreshing, and the thin-sliced tomatillos provide just the right touch of acidity. Here’s my version. Prepare the shrimp. Cook the corn kernels in boiling, salted water until tender-crisp, 1 to 2 minutes. Rinse under cold water and drain. 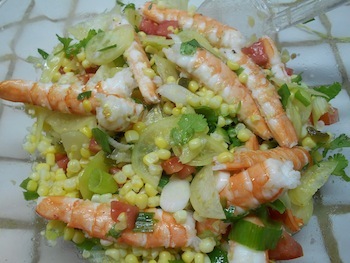 In a serving bowl, combine the cooked shrimp and corn with lime juice, tomatillos, jalapeno, tomato, scallions, cilantro and olive oil. Toss to coat, season to taste with salt and pepper, and serve. Makes 4 servings. Tomatillos are usually sold in their papery brown husks. It’s OK to remove the husks for storage, because this helps prevent decay. Tomatillos will keep for 3 to 4 weeks in the refrigerator with husks off and stored in a plastic bag, and two weeks with husks on. Sometimes the thin husk will stick to the fruit. An easy way to peel it is to soak the tomatillos in hot water for a few minutes. If you grow your own, be aware that tomatillo plants are prolific and even a couple will probably produce more than you can use (and you do need two plants for proper pollination). The entire plant may be uprooted before the first frost and hung upside down in an unheated garage. The tomatillos on the plants will remain fresh for at least two months this way, according Rodale. Green tomatillos usually are preferred to ripe yellow ones, although I like the mellower, fruitier flavor of yellow tomatillos when eating them raw. Green tomatillos are prized for the tart, acidic flavor they add to salsas. Why bother growing vegetables when you can have them delivered right to your door? Graf Growers on White Pond Drive in Akron now offers that service. It’s a wonderful idea for those who can’t or don’t want to dig in the dirt. A weekly basket of produce includes 6 ears of corn, 2 pounds of tomatoes , lettuces, a quart of peaches and a surprise item. Also included are one to two additional fruits, a starch and three locally grown vegetables. The cost is $50 delivered or $35 picked up. The orders are codes 44333, 44301, 44313 44321 and 44320. To order, call 330-836-2727. I would like to make Buffalo wings on the grill instead of deep-fried. Should I add the sauce before, during or after cooking? I know when they’re fried you sauce them at the last minute. This would be easier than brushing it on the wings on the grill. Dear Robert: You don’t have to apply the sauce while the wings are cooking. As with the deep-fried version, place the melted butter and hot sauce in a large bowl, pour in the cooked wings and stir to coat. Local blogger Mike Vrobel of Dad Cooks Dinner once ran a recipe for grilled Buffalo wings that intrigued me. To produce crisp grilled wings that rival deep-fried, he borrowed a technique from J. Kenji Lopez-Alt of Serious Eats. Dry-brining with salt and baking powder is the secret.